I'd say: let's post ONE pic each, one per user, and then we can do a poll and vote. It can be about Inter, antimilan, antijuve, whatever you like. What do you think? One thing's for sure: it'll be hard to pick one in the end! i like this one because it symbolises to me a group of players who are willing to die and work their balls off for the black and blue. It was a tough choice between 2 excellent games in the Coppa Italia Final & the recent Milan derby. However, in terms of overall aesthetics & looks, this one wins easily. This is not related to Inter/football, but I think it's cool. Guess who won? The guy on top. It was the eighth stage of Tour de France on July 9. 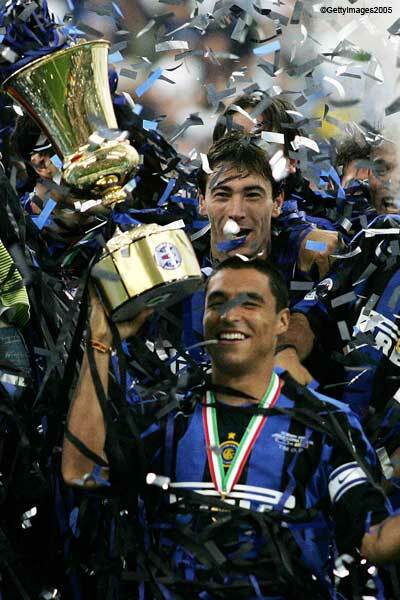 I certainly will remember this for a long time if not for ever as I was in Meazza myself! Again, as I mentioned after my return from the game Dida had himself to blame a bit for what happend to him. Come on Ashkan, just do some Google-ing! Off topic, I see that you mods have turned into Fiorentina fans (your moderators bar is viola! ). Sure, however as I said Dida should take some of the blame as well. Anyhow, lets not turn this thread into a duscussion about what happend that night! hehe - well, that should be directed to the admins! I cant do much about it. Anyway, rather viola than zebra colours! Oh yeah, actually I don't mind the Viola at all, you can tell straight away that the president is a good guy. He looked so sad when Gobbi won in Florence, very genuine. Right this is wayyy off topic, let's see more pics! That is my entry and I'm sticking to it! Yeah, I ran out of colors. Better purple than red, right? Btw, Enricos, I can't see your picture at all. I take it you meant when Adriano kissed the shirt after scoring his winner? Attach the picture and i'll fix for you. For some reason, Inter.it pictures aren't always displayed on forums properly. Any of you encountering the same problem? Not that I know of, I can see Enricos' pic right now.